50 x 10 cm. Edition of 19 for this 4 piece work. 200 Euros plus p & p.
Detail: view from outside along 20 metres of windows, Galerie de Pieter, Leiden. Detail: showing the middle third of the arrangement of images. 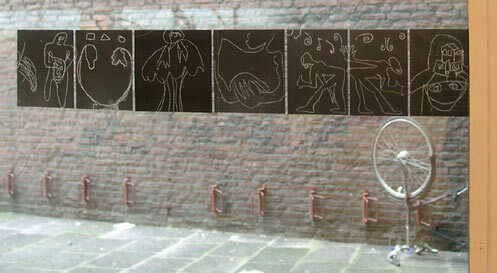 Detail: view from inside along 20 metres of windows, Galerie de Pieter, Leiden. The wooden structure on the right is our work "House of Worship "